Playing With Imagination is a series where I talk about video game stories and plots. Many video games have incredible stories and are often overlooked in our society. 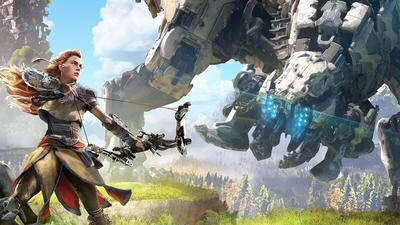 Today, I talk about Horizon: Zero Dawn from Guerilla Games. So I’m discussing a game that came out in…oh…February. And not only did I just get this game in August, but I started up again Saturday. I someday hope for literary awards, but if there’s one thing I can easily get an award for, it’s laziness. It takes me a while to actually do things. I often play a game I immediately get, but for whatever reason, I held off on this one. I feel bad too because this is an amazing open world game with a stellar story. Anyway, I’m talking about Horizon: Zero Dawn, developed by Guerilla, who is best known for the Killzone series. It’s nice to see them do more and it’s always good to broaden your horizons. Speaking of, Horizon: Zero Dawn is an open world RPG that feels gorgeous to look at. I haven’t finished the game yet. I’m not even that far in. I’m only 9 percent of the way through and just survived the Proving. While I won’t go too in-depth, I want to give my brief and initial thoughts on the game. To start, the story is set in the distant future. Machines rule the world and the world regressed back to a natural state. People live in nomadic tribes and one girl, Aloy, is considered an outcast among her people. So far, it isn’t explained why she’s an outcast, but I’m sure I’ll figure it out over time. Anyway, as a kid, she stumbles upon the Metal World and gets a Focus, an item she uses to scan the entire surrounding area to help her out on her journey. She trains with Rost, who is like a father to her and is also an outcast. I won’t go any further than that, but it’s a great game. The combat is wonderful, the world actually feels dangerous and the story is amazing. I like Aloy’s character. In fact, she might slowly become one of my favorite female protagonists in gaming. She feels human, which is what a character should do. The story is a wild ride. She goes from being shunned by her own people, to trying to win back that trust, to going back to the same hole she came from. You almost expect the story to go a certain direction, but it keeps you on your toes. I love the story so far that shows the main character fighting for respect in a society that hates her because of who they see her as and not who she really is. The combat is nice and fluid. Using the bow feels natural and the hunting mechanics feel real. Some enemies require stealth to kill, but it gives that sense of danger that you can’t just rush in and kill everything with no effort. There’s a sense of strategy to it. As a side note, I don’t like stealth in what are usually action games. Genre shift aside, I’m not that good at stealth. I’m not sneaky or aware enough to be careful and not get caught. Especially in games where getting caught always results in a game over. I’d like to salvage my screw up and go on as if nothing happened. I feel that the stealth is well done. You feel a sense of danger and it feels like you’re hunting rather than just running up to an enemy and bashing it to death. It’s what I look for in a game like this. The graphics are beautiful. It feels like you’re in some northern US or Canadian wilderness mixed with robots. It’s familiar, yet feels unique in its own right. It still feels futuristic, with the robots and the Focus. It’s a unique environment that somehow meshes well together. I love this sense of old world meets new world, past meets future. It’s a concept I want to see more of. So without spoiling the story, I’m enjoying this game a lot. It feels real and the story is worth it alone. Even though most games feel like FPS overload, it’s nice to see a developer go out of their way to make a game truly extraordinary. I’ll have proper input in the coming weeks, so stay tuned for that. A bit short this week. I had something planned before, but things don’t always go as planned sometimes. Next week is Halloween, so I’ll do something for that.